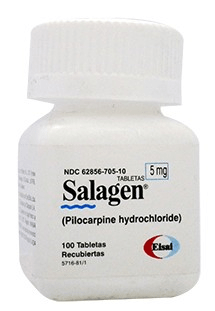 Cevimeline (Evoxac®) and Pilocarpine (Salagen®) are used to treat symptoms of dry mouth due to Sjögren’s syndrome, an autoimmune disease. They belong to a class of drugs known as cholinergic agonists. These work by stimulating certain nerves to increase the amount of saliva produced, making it easier and more comfortable to speak and swallow. They may also increase aqueous tear production. Before starting these medications doctors may check for cardiac arrythmias, gallstones, kidney stones, asthma, narrow-angle glaucoma, or other conditions. Side effects can include sweating, runny nose, drooling, and headaches.